We were fortunate to have the Rights of Way Officer as an invited guest. Ever since the rumour mill threw up information about the proposal to replace the footpath with a new bridleway, people have been wanting to learn more about the proposals. Basic information has been hard to come by. 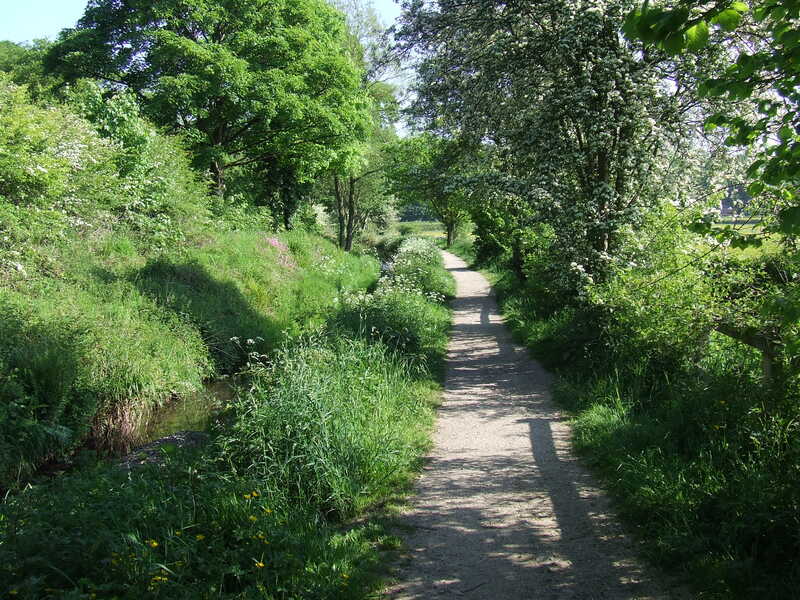 Many visitors drive to the Country Park, park and then walk on the path by the stream to Little Wood, often following a circular route back to the Car Park. This is a well trodden path. Anyone who has used this path for a period of 20 years or more can apply to the Rights of Way Officer to have this path recorded and dedicated as a Public Right of Way. Application forms can be obtained from the Rights of Way Officer. Completed forms can be submitted to him and , once they work their way to the top of the pile, the Rights of Way Officer will then assess the evidence. This part of the process can take unto 12 months. This process may be a way to enable the current footpath to be kept. However, what is not clear is how this process will play out given the current plan to put in a new bridleway on the other side of the hedge. The Rights of Way Officer explained that the current plans for a Bridleway grew out of a national planning exercise, when all local authorities were required to put forward a Right of Way Improvement Plan in 2007/8. Consultation of users was required before drawing up the plan. Although many of the people present at the meeting have been involved with the Friends of Chadkirk group at the time, none recalled any consultation. Had there been any more recent consultation? We learned that the Rights of Way Officer has meetings with ‘user groups’. There had been a meeting earlier this year (who knew?) and there is another one planned for December. However since no-one from the Friends group had information about (or invitation to) these meetings, perhaps it would be fair to say that it would be impossible to make a contribution to the information gathering part of the process. A commitment was made to notify the group of the next meeting. However, the timing of that meeting is unhelpful, given the suggestion that the bridleway is to replace the current footpath in the autumn. How much will the new bridleway cost? Where are these funds coming from? Who decided that this was a better way of spending scarce resources than, for example, repairing the oft flooded car park and/or maintaining the present footpath? How were the majority of users consulted about the plans? How will a 3m wide bridleway affect the conservation goals of the Country Park? This will take up part of the Coronation Meadow. Does a new bridleway require planning permission? Although there were unanswered questions and matters remain to be resolved, a more senior representative (with responsibility for some aspects of this issue) employed by the local authority will be invited to attend next month’s meeting of the Friends of Chadkirk. This meeting will take place on Thursday 2nd October at 7.30 pm in Chadkirk Chapel. What’s new at Chadkirk …. July 2014…what’s new at Chadkirk? Observant walkers and strollers will have spotted them. Wooden hares. Or rabbits? 12 of them. Markers. Low down near ground level. Jumping rabbits? Or running hares? There to spark the interest of curious youngsters as they move around the new Chadkirk Trail. And from Friday, any one a bit taller who can read will be able to learn a little bit more about Chadkirk at each Hare point or Rabbit stop. The old signs on the Chadkirk Trail have become so weathered that they are virtually opaque. On 11th July 2014 new information boards will be set up around the Chadkirk Country Park. There will be 11 on the Chadkirk Trail and a 12th down by the ‘new’ bridge. Each of them providing some information that will , for many visitors, add to their enjoyment of the unique landscape of Chadkirk. Regular visitors will have chance to see the new boards from Friday onwards. If you are one of the many people who visit Chadkirk for Chadkirk Festival at the end of July, look out for the hares!